2 days of live music from some of the best tribute acts in the U.K from Muse, Queen, U2, Bon Jovi, Coldplay, Elton John and Guns N Roses. 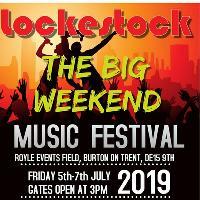 To buy tickets for this event please visit the events page: Lockestock 'The Big Weekend' event tickets. A fantastic line up of some of the best tribute act and cover bands in the U.K.
Don't forget you will still need to purchase a camping pitch and entry tickets.